With The Après Ski Academy, Discover ... The Snake-Gliss ! This is a "must do" Après ski activity! The Snake-Gliss (or sledge Rando) is a unique concept using articulated sleds. The Snake slides down the ski slopes like a snake on the snow! Equipped with fins and controllable with the feet, these sleds allow you to make perfect curves. In a memorable atmosphere: an unusual experience is guaranteed! 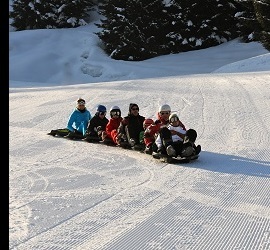 Supervised and / or controlled by the ski school instructors, try a new adventure with the Snake Gliss.